Aberdeen manager Derek McInnes believes former colleague Jim McIntyre is "a good fit" for Ross County. McIntyre, 42, has been named as Derek Adams' replacement in Dingwall after leaving Queen of the South. McInnes, 43, played with McIntyre at Dundee United and then had him as part of the coaching staff at Bristol City. "He's got a good understanding of the game, someone who really applies himself well and has a really strong work ethic," McInnes told BBC Scotland. "He's managed now at a couple of clubs and I've no doubt he'll go and take that challenge. It's a good job for him. It's a good decision by Ross County, from the outside looking in. "Jim will be very demanding of his players but do everything he can to prepare them Monday-to-Friday to get that result on a Saturday. "I'm delighted that he's got the opportunity to show in the Premiership that he's such a good manager." McInnes expects McIntyre to bring "enthusiasm and energy" to Victoria Park as County seek to get their points of the season after five straight Premiership defeats. "There's a lot of good managers in the Premiership at the minute and Jim will be another one added to that," McInnes said of the former Dunfermline boss. "The job he did previously at Dunfermline was excellent. His record was very good in getting Dunfermline promoted. 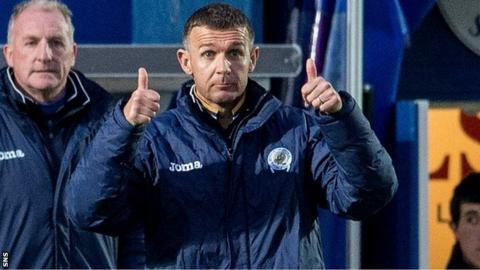 "He took over at Queen of the South and managed to get them into the [Premiership] play-offs last season and they look as if they've started brightly again this season in a very difficult league. "People recognise good work being done and people recognise that Jim has done a good job, certainly at Queen of the South and he's certainly earned the opportunity."